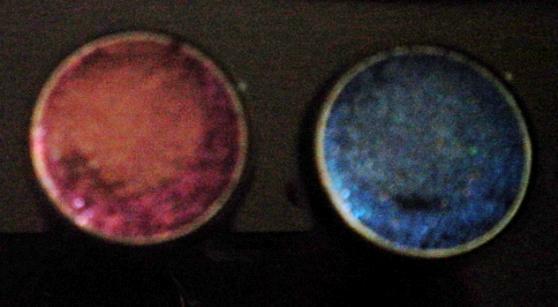 I don't know if it is very clear but I was almost hitting pan in TWELVE out of twenty-four colours - so half of the palette! The palette has never been used and you can clearly see from the swatches that I have hardly used copious amounts of the product. I am bitterly disappointed now as it is obvious there is barely any actual product in each compartment. 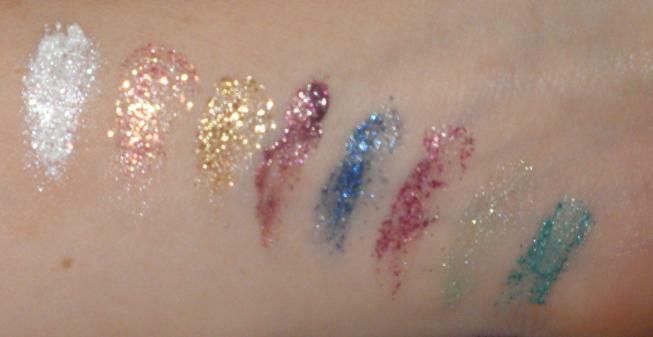 I am aware that Urban Outfitters is not a beauty store and that £12 for 24 eye shadow colours is very cheap plus one would probably only use a little of the product each time - even so - I do not believe I should be seeing pan after swatching a shadow once! So my overall thoughts are that every colour is fantastic and the price is very reasonable as you get so many colours (even though some may seem slightly similar I believe some are just subtler shades to enable you to be more or less daring!) but there is clearly not much product actually IN the palette itself. However, for a cheap palette from a clothes store I would say this was a good buy and I am pleased I purchased it. My advice to you all is to run out and buy it - but just don't swatch it ! LUSH - Oatifix Fresh Face Mask Review. Now firstly, I have to say I am not a big 'Lush' fan - I have never found that any of their products work that great for me and whenever I walk into the shop both me and my boyfriend always seem to end up overwhelmed by the smell! 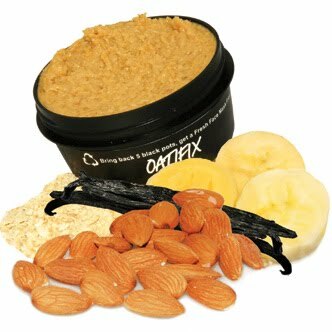 But I do adore the concept and am always interested to try new things so I read a review on the Oatifix mask and decided to try it. Use it to clean and soften dry and sensitive skin. It was invented at our Ready Steady Create weekend by a group of enterprising Lush shop managers. You will be delighted to hear that a blend of fine oatmeal, fresh bananas, ground almonds and vanilla smells as tempting as a very posh breakfast, and even more delighted when you try it. Oats are a wonderful thing; they calm your skin (and if you eat them they help to reduce cholesterol). Ground almonds give you an exfoliating scrub, bananas are a lovely, nutritious skin softner and illipe butter reduces redness. Cleansing yet moisturising; just right. Not that this is relevant to the product itself but I must add that I found the girl in Lush very very helpful and sweet in explaining the different ingredients and how to use the product etc etc - it is always nice when the assistants are helpful and also seem 100% informed and passionate about the brand they are selling! I used the mask that night in the bath and my first thought was 'this stings!' which I was definitely not expecting! I was slightly worried but I left it on regardless. When I washed it off i actually found it left my skin red (it is meant to reduce redness) and where I had been using blemish cream my skin just on the sides of my nose - the skin was now dry and flaky (it said it is meant to moisturise!). So I was originally very unimpressed - it did, however, leave my skin feeling smooth. Yet I did not want to immediately write off this product so I decided to try it again about 5 days later (the night before my surgery). I had stopped using any harsh blemish products and my skin was back to its normal state (so no dry patches whatsoever) so I felt using the mask on my skin at that point would give a better indication of how it affected my skin. I had been keeping it in the fridge and I found that this time when I applied it it did not 'stick' well to my skin - when I applied it half of the little granules fell straight off my face and down the sink so I had to try and coat my face in the product and walk very carefully over to the bath. It also looked (this is so crude but it is the best comparison) as though someone had rubbed vomit all over my face (I told you it was crude but it REALLY looked like that) but on the plus side it smelt gorgeous. So you can see there that it does not 'sink' into your face properly it just sits on the surface and the majority of it falls off! Anyway I left it on once again and then gently scrubbed it off. Again it left my face looking red but I suppose this could be due to the exfoliating effect but it also did not 'improve' any redness the next day. This time I did not have any dryness or stinging so I strongly suggest you do not use this if you have sore/broken/dry skin as I assume that is why it stang the first time I used it. Once again it did leave my skin feeling smooth. At £6.45 it is not too expensive and the lure of all-natural ingredients with no preservatives is very appealing. It smelt lovely and it left my skin feeling very smooth yet it had no real effect on redness and actually exacerbated it immediately after use and I don't believe it made my skin much more moisturised - in fact left it feeling slightly tight. I doubt I will be re purchasing this product but may use it a few more times. Unfortunately i am still not a huge Lush fan and this product did not live up to my expectations. I will do another blog post later tonight to announce competition winners!